Lasik Eye Surgery | Dr. Thomas John, M.D. Dr. Thomas John, a world renowned vision correction specialist has performed thousands of LASIK procedures since LASIK became approved in the late 90’s. Dr. John has helped people to eliminate their needs for glasses and contacts by offering LASIK to his patients. 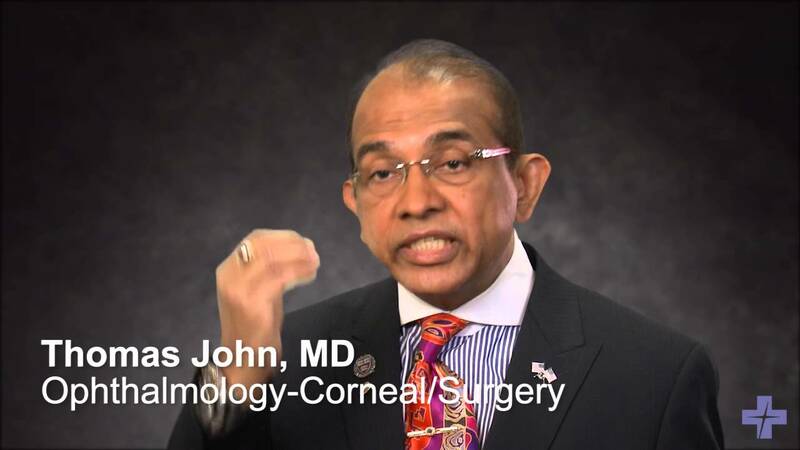 Years of experience and dedication have helped Dr. John become an international leader in the world of ophthalmology. He makes sure that every patient’s procedure is performed at the highest standards to ensure better vision. LASIK is a refractive surgery procedures used to help correct vision in patients who suffer from nearsightedness, farsightedness or astigmatism. The procedure is relatively simple and dramatic results can be achieved within minutes. A microkeratome (a sharp metal blade) is used to create a corneal flap so that a laser can be used to reshape the cornea. By reshaping the cornea, light reaches the retina properly so that clearer images can be displayed. A computerized system determines the amount of the corneal shape that needs to be changed. Each person has a different corneal shape so each procedure is different. A number of tests will be performed before the actual procedure to make sure that the accurate measurements are taken to ensure better vision after LASIK. During LASIK, creating the corneal flap is the first step and one of the most important step in the procedure. The skilled hand of the surgeon will use a microkeratome to create a small flap that will be lifted back during the procedure. The laser is then used to deliver a calculated number of pulses to successfully alter the shape of the cornea. Each pulse will remove minor amounts of the corneal tissue so that the proper shape is created. The shape of the cornea is now flattened rather than steep like before. The new shape allows the rays of light to focus more directly on the retina and clearer images are seen. Many LASIK patients notice a substantial improvement directly after the procedure. However, your vision will continue to improve over the course of the next few weeks. The office will usually provide you with both antibotic and steroid eye drops to make sure the eyes are healing properly and to possibly prevent infections. In addition, artificial tears will be used to keep the cornea moist and smooth while healing. With any procedure it is important to follow the instructions provided by the doctor after surgery. You should follow the instructions for optimal healing. To ensure the healing is taking place properly, you will have scheduled follow-up appointments with the doctor. He will examine your eyes and make sure they are healing correctly. Typically, the first follow-up is the day after your LASIK procedure and then they are scheduled in various increments depending on the severity of your case and the healing process. To learn more about LASIK or if you are thinking about having LASIK, please contact Dr. Thomas John at 708.429.2223. The above information is provided by Thomas John Vision Institute, P.C., and is not intended to replace the medical service and advice of Dr. John. Kindly consult your health care provider for advice regarding any special medical/ocular condition. Copyright 2016 Dr. Thomas John M.D. All rights reserved.